EJ Phillips was Anglican. Was John Nickinson? What were the Dolmans? New York Feb 25th 1886 I should imagine [your new home] was a great improvement over the Chandler Mansion. I hope the family are Episcopalians, that you will attend Church with them. It is a duty you owe yourself as a Christian and will certainly do you no harm, but on the contrary I hope you will feel benefited by it. Albert had just moved to Middletown NY. New York Apr. 2nd 1886 Mr. [Bernard] Macauley's funeral took place at the Catholic Church on 16th Street. I saw and spoke with General [Daniel] Macauley [of Indianapolis] and his Mother, and Jennie Johnson. High Mass was celebrated. So you think Thanksgiving will be the time! Is it to be in Church or at the house? It was Thanksgiving, and they always celebrated their anniversary on Thanksgiving. We have cards from the wedding, which only say Mr. and Mrs. Nickinson. Don't know whether it was at a church or house. New York, Jan 6th, 1890 Too bad you both missed the first Sunday of the new Rector in the church. I am glad he made a success and hope his influence may be the means of bringing the people together in love and harmony. Has the church "Pew seats" or "Free seats"? if rents, how much per year? New York 11-29-1895 Thanksgiving I went to 11 o'clock Service at Calvary [Church] and to shop at 1. Mrs. Ahearn gave me my dinner at 12:25. She set the usual old time dinner -- Roast Turkey, Goose, Ducks and boiled tongue, Celery, Cranberries, Grapes &c -- and ice cream. Designed by James Renwick Jr. in 1846 Calvary was the Roosevelt family's church (including Teddy and Eleanor). Rev. Edward Washburn, rector 1865-81, was model for Dr. Ashmore in Edith Wharton's Age of Innocence. Boston May 15th 1890 I have attended St Paul's Church the past two Sundays. It is an old fashioned building with high backed pews, the organ and choirs in the front part of church with a gallery. The fashionable Episcopal church here is "Trinity". Phillips Brooks is the Rector -- it is almost an impossibility to get a seat there on Sundays and being a considerable distance [about 3/4 mile] from this hotel, I do not try. Denver, Aug 31st 1890 I have just returned from Morning Service at Dean Hart's Cathedral. The Dean preached a fine sermon from the text, "And who is my neighbor?". The Dean is an old acquaintance of Mr. & Mrs. [Frederic] Robinson and he was tutor to [Maurice] Barrymore in England . He came and established the Church here at his own expense -- having a large private fortune of his own. The Church was filled this Morning and he seems to be very popular. Mrs. Robinson was there with a lady friend, Mrs. Pierce who is a member of the church. They brought me to the hotel in Mrs. Pierce's carriage. 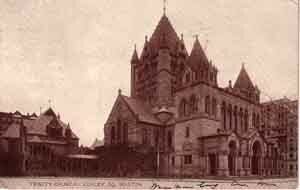 The parish was elevated to a cathedral church in 1879, the same year that the Rev. H. Martyn Hart of Blackheath, England, was called as rector and subsequently appointed dean. He, his large family, and household moved to a boomtown. During his tenure as dean, Denver grew from approximately 36,000 to 107,000 people, and became the largest city in the Rocky Mountain west forged by a single generation’s fortunes from gold, silver, coal, zinc, lead, and oil. Dean Hart brought the English tradition of architecture to both churches he helped build. The first cathedral, at 20th and Welton Streets, was Romanesque in style, and the third structure built as an Episcopal cathedral in the United States. Arson destroyed this church in 1903, but most of the stained glass and wood carvings were saved and incorporated into the present building eight years later. Columbus Ohio, Mar. 1st, 1895 Mrs. Cady and Mrs. McKenzie called on me, the latter Albert's Sunday School teacher's wife. Mrs. Glessing called at the hotel and wanted to take me home, and if I had had another three days, I think I should have seen everyone from Christ Church [Indianapolis]. Albert [and Hattie?] seem to have lived with the Fays in Indianapolis when they were young. German was said to be spoken in that house. Philadelphia, Sept. 20, 1891 I went to Church this Morning at Girard Ave & 27th Street. Quite a bright pretty church inside -- surpliced boy choir but no further attempt at "High Church". St. Augustine's Church of the Covenant is at 2701 West Girard Ave.
Philadelphia, June 21, 1888 [Grandson Jack Dolman] is a fine boy anyway. As you are not likely to come here for your birthday, I do not suppose the christening will take place on the 8th as that was my proposition. New York, Dec. 24th 1890 Yes! I had an idea that the little dress and skirt would do for [grandson] Edward's Phillips Nickinson's] christening robe, and am glad you think so too. I am pleased to hear he is growing fast and is less cross. New York, March 21st 1891 It was as well that the christening was postponed for it was a dreadful day and the babies would certainly have caught cold. New York, March 22nd, 1891 Hope to see you all sometime before end of season here. Let me know when the children are likely to be christened. I will try to be present. New York, Mar. 24th, 1891 I shall be sorry not to be present at the christening of the dear little ones, but if the weather continues so cold and I still feel as I do, I think it would be unwise for all our sakes to have me take the trip. Letter from Hattie this Morning saying she now feels a trouble to herself, she is growing so fat [pregnant with Elizabeth Ellen]. Tells me to go to the christening as she wouldn't like me to be absent if it was her baby. Washington DC, April 25th 1891 I am delighted that [grandson] Edward is doing so well and enjoys his outings so much - he will grow good and strong with such treatment. I hope you will have him christened Sunday. Of course it would afford me great pleasure to be present - but I think his christening is too important to be put off until I could attend, which could not possibly be for some weeks to come. ... Think of me at the christening, for I shall think of you all and be with you in thought, if not in person. Baltimore, Apr. 28, 1891I hope you had [grandson] Edward [Phillips Nickinson] christened on Sunday. It was a perfect day in Washington. His trip to Otisville would strengthen him for the short journey to Church. New York April 14th 1892 I thank you for your very cordial invitation for Easter and darling little Edward's christening at which it would give me great happiness to be present. All will depend upon the weather and my health. Make no preparation for me or expect me. Then you will not be disappointed if I should not appear. If I make a start I will telegraph Albert by what train to expect me. I am glad Edward is growing so nicely and talking so much. He must be very entertaining now. It will give me great pleasure to see him and his little cousins "received into the congregation of Christ's flock". When was Edward Phillips Nickinson finally christened? I should get in touch with Grace Church, Middletown. New York, Feb. 28th 1887 The idea at present [for daughter Hattie and wedding] is that we go over to Phil[adelphia] on Easter Sunday AM. Have Mr. Graff come to the house to tie the knot. Then you and I take the train for NY, I having to play that night. New York, Apr. 12, 1892 Enclosed find order for 15 -- 5 apiece for your Easter Eggs. With this I send you the last "Fair Tokens" which will show you the Fair is doing well. New York, Mar 5, 1894 So I expect my season will close on the 1st of May. Where I do not yet know, as we have not yet heard our route: only that we close Holy Week and begin our new season at the National Theatre, Phila on Easter Monday. Boston March 23rd 1895 Have just got back from Post Office, where I had been to send as order to Albert for your Easter Eggs, and Hats. Please divide it, as you did the Xmas orders - with my love and good wishes to you all for a joyous and bright Easter. Easter seems to have been business as usual for theatres. New York, July 19th 1895 I returned last Evening after seeing the last sad but beautiful rites performed over our dear departed friend [John Dolman Sr.]. Services by the Rev'd Mr. White, who married Hattie & John, and Mr. Walker of Zion Church were conducted at the house and finished at the grave. Zion Church was an offshoot of St. Michael's. This congregation erected a building at the corner of Fourth and Cherry Streets in 1766. It was destroyed by fire on December 26, 1794 and rebuilt in 1796. It was the largest church building then in Philadelphia. So prominent was the Church attended by George and Maria Garlinger, that when news of Cornwallis's surrender at Yorktown reached the city, the Continental Congress assembled at Zion Church to give thanks on October 24, 1781. On December 26, 1799, the Mock Funeral of Washington proceeded to Zion Church, where Henry Lee delivered an oration on the General and first President. In this discourse, he made use of the phrase "first in war, first in peace, and first in the hearts of his countrymen." When he originally offered a resolution in Congress, he used the word "country" instead of countrymen." The building was removed, in 1870, after the erection of the present church. (Source: Encyclopedia of Philadelphia, Page 1065) On July 4, 1776, the Continental Congress declared Independence for the united States. This occurred just down the street from the St. Michael and Zion Church. http://www.garlinger.com/gerlinge/d0/i0000521.htm Seems to be a Lutheran church. Philadelphia Sept. 6th, 1897 Yesterday I attended the funeral services of Mrs. John Drew at St Stephens Church and followed her to the cemetery which is not far from us. The Church was packed with people and the Cemetery was crowded. There was no getting near her grave. Mrs. Dolman was with me. Louisa Lane Drew is buried in Mt. Vernon Cemetery, Philadelphia, 3501 West Lehigh Ave.
Philadelphia, Novr 24th 1897 One month from today will be Christmas or rather tomorrow and your anniversary will be on Sunday the 28th. That is the date when our little stranger [Melanie Dolman] is expected. Will be nice if it would arrive that day. But Man proposes and a Higher Hand Disposes and we must be satisfied with His Will! Whatever it may be and be thankful. Saints & Sinners featured J. H. Stoddart as Jacob Fletcher, "a devoted, self-sacrificing clergyman who refuses to knuckle under to a blackmailing deacon and so destroys his own career by admitting to his flock that his daughter has gone astray." Thanks to James Weiss and David Seigenthaler and Emmanuel Church Boston for introducing me to Historic Liturgies 2004 which encouraged me to pull this webpage together.